Entertaining and provocative...a satisfying intellectual bout. 122 min. Universal Pictures. Director: Ron Howard. Cast: Frank Langella, Michael Sheen, Sam Rockwell, Toby Jones, Matthew MacFadyen. In Peter Morgan's play Frost/Nixon, author and journalist James Reston Jr. schools TV presenter David Frost about the import of his planned interviews with disgraced President Richard Nixon: “The American people need a conviction. Pure and simple. The integrity of our political system, or democracy as an idea, entirely depends on it.” That the American people still need that conviction, years after Nixon died and in the dramatic form Morgan offers, testifies to the deep, unhealed psychic wound Nixon caused with his criminal malfeasance in the early 1970s. 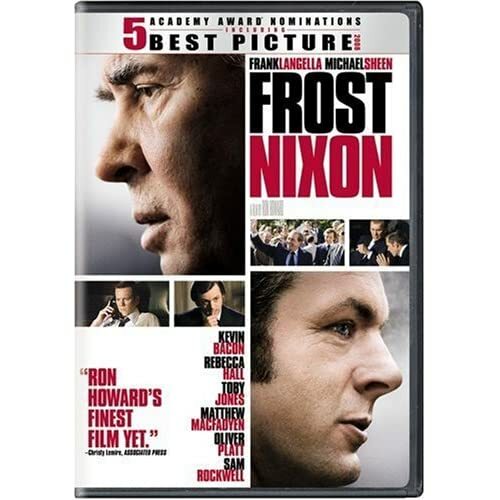 A dynamite theater piece, Frost/Nixon gave Frank Langella (as Nixon) and Michael Sheen (as Frost) roles of a lifetime on London and Broadway stages (Langella won a Tony Award and an Oscar nomination for his portrayal of Nixon). The crisp lines of Morgan's play re-fashioned history—a series of carefully vetted, mutually beneficial interviews conducted over twelve days in 1977—into a satisfying intellectual bout between the retired President itching for a challenge and a down-but-not-quite-out TV personality looking to be taken seriously. Though hardly subtle, Morgan's boxing match language keeps the underlying metaphor alive throughout his self-adapted screenplay. Nixon says, "I've never been challenged to a duel before... no holds barred, eh?" and, later, "I shall be your fiercest adversary. I shall come at you with everything I've got." Frost counters, "Only one of us can win." Reston (Sam Rockwell) and fellow journalist Bob Zelnick (Platt) are Frost's "corner men." Frost's producer John Birt (Matthew Macfadyen) advises, "Attack more...Keep your distance...He was toying with you...Never forget: you are in there with a major operator," while Nixon's chief of staff Jack Brennan talks of "that impact from the champ's first jab," a few minutes later coaching, "Control the space. Don't let him in." Frost: Are you really saying the President can do something illegal? Nixon: I'm saying that when the President does it, that means it's not illegal. Morgan and Howard mine considerable humor from the President's forced retirement, lived restlessly from La Casa Pacifica, and the financial appeal of the interviews to both Nixon and his agent, one-of-a-kind Hollywood legend Swifty Lazar (Toby Jones). The early years of "checkbook journalism" provide but one of the film's themes. Reston reflects on "the reductive power of the close-up," an idea cleverly amplified by use of monitors on stage, and one that's organically, unavoidably woven into the fabric of the film. Frost sums up America's unique potential for the highest highs and the lowest lows when he remarks, "Success in America is unlike success anywhere else" (a lesson Morgan—the Oscar-nominated screenwriter of The Queen—has learned first hand). Morgan and Howard also cultivate an implicit point-by-point comparison of Nixon's Cambodian strike to Bush's WMD predication for the invasion of Iraq, civilian bombing, and radicalization of Iraqi extremists. In the final equation, though, Frost/Nixon comes down to its essence as a showcase for two well-matched actors. Though their work was marginally more potent on the stage, it's wonderful to see Langella's and Sheen's performances immortalized on film. Their most memorable scene unfolds with neither looking the other in the eye: an entirely fictional but entirely plausible "night before the battle" phone call made by a drunken Nixon to Frost. The scene is a perfect example (and best defense) of how drama can thoughtfully subjectify reality to achieve what's often called "a greater truth" than fact. Frost matches that tasty scene with a delectable post-interview coda, during which Nixon muses, "Maybe you should have been a politician and I the rigorous interviewer." Entertaining and provocative, Frost/Nixon refreshes the lessons of the man who set a low bar for modern presidents—influential more for what he did wrong than what he did right. Frost proved influential, too: the age of spin that followed the interviews seems designed to avoid exactly the pitfalls a prideful Nixon failed to circumvent entirely. Universal does it again with an exceptional Blu-ray transfer of source material that could well have proved problematic. Salvatore Totino's rich '70s color scheme and delicate play of light look fantastic in high-def, which features spot-on contrast and detail. The DTS-HD Master Audio 5.1 mix can be considered definitive in rendering the film's theatrical surround experience. A feature commentary with director Ron Howard finds the director energetic and rightly pleased with his film, and he keeps up a fine pace chatting about the project's origins and the collaborations that brought the film to fruition. Universal provides one of its patented U-Control tracks in The Nixon Chronicles, offering "real-time information about the people and events...including historic video from the Frost/Nixon interview." There's also a separate Picture in Picture track with "cast and crew interviews and behind-the-scenes footage." An extensive collective of "Deleted Scenes" (30:28, SD) makes it to disc, as does the Blu-ray exclusive featurette "Discovering Secrets: The People and Places Behind the Story" (13:19, HD), showcasing interviews with Howard, Sir David Frost, director of photography Salvatore Totino, production designer Michael Corenblith, Mr. and Mrs. Smith (owners of the Smith House), and Frank Langella. "The Making of Frost/Nixon" (22:58, HD) will look familiar to consumers of Howard's other films on home video. It's a well-made and reasonably comprehensive making-of with comments from Howard, executive producer/screenwriter Peter Morgan, Michael Sheen, producer Brian Grazer, Frost, Langella, Matthew MacFadyen, Oliver Platt, Sam Rockwell, Kevin Bacon, executive producer Todd Hallowell, costume designer Daniel Orlandi, Rebecca Hall, Totino, and Corenblith. "The Real Interview" (7:28, HD) focuses on the original broadcasts and their recreation, as discussed by Howard, Langella, Corenblith, Bacon, James Reston Jr., and Totino, while "The Nixon Library" (6:22, HD) examines the tourist attraction, with comments by Howard, Nixon Library executive director John H. Taylor, and assistant executive director Kathy O'Connor. As usual, Universal also offers My Scenes and BD-Live connectivity, rounding out another stellar Blu-ray title. All site content © 2000-2019 Peter Canavese. Page generated at 04/18/2019 12:54:02PM.